Tuning your database for optimal performance means more than following a few short steps in a vendor-specific guide. For maximum improvement, you need a broad and deep knowledge of basic tuning principles, the ability to gather data in a systematic way, and the skill to make your system run faster. This is an art as well as a science, and Database Tuning: Principles, Experiments, and Troubleshooting Techniques will help you develop portable skills that will allow you to tune a wide variety of database systems on a multitude of hardware and operating systems. Further, these skills, combined with the scripts provided for validating results, are exactly what you need to evaluate competing database products and to choose the right one. 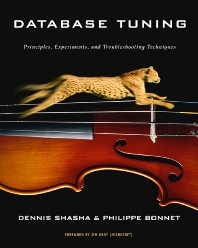 Dennis Shasha is the author or coauthor of seven books, including this book's predecessor Database Tuning: A principal Approach (Prentice Hall) and Out of Their Minds: The Lives and Discoveries of 15 Great Computer Scientists (Copernius/Springer-Verlag), numerous journal and conference papers, and four patents. He also writes monthly puzzle columns for Scientific American and Dr. Dobb's Journal. Philippe Bonnet is an experiment database researcher. He directs code development of the open source object-relational database system Predator developed at Cornell.